I love my cart is pretty much full by the time I leave the first aisle in the grocery - the produce & health food/natural section. I usually just go to the back to get orange juice, bread & sparkling water & I'm done. Can't wait to venture around & see what everyone else is thankful for this week! A warm and cozy home is something that I too often take for granted...especially on COLD days like today! Thank you, Lord! I wish I knew how to knit. My grandmother was a genius at it...kicking myself that I didn't have her teach me! Nothing like being warm and cozy on a winter day- that is what I am doing! Working from home- it is -17 degrees here in MN! :) Thanks for linking up! Love the picture of you with the scarf. Looks so warm. So does your house. love little snippets of daily things like this. sounds like a good (but cold!) week :) hope you're just as blessed this week! I love the scarf you made. It does look warm and cozy! Also, I love canvases! avocados DO make everything better! I could use a pretty scarf like the one you made! It's 16 here today with the wind howling. Brr!!! How awesome that somebody secretly bought your meal. I just love that! 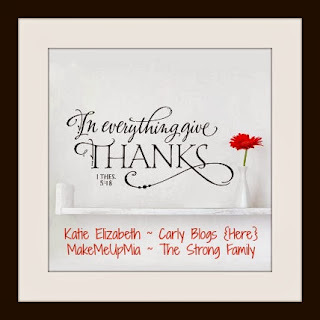 Thanks so much for linking up with us!! I'm with you on all of it! Just made some guacamole with fresh avocados today! So yummy! Love the scarf!! Love the healthy cart!! !